To be removed from the cacophony of sounds which fill the urban landscape could cause a deprivation psychosis seeing as urban cacophony has been integrated or accepted as a normal way of life. In the modern era a cultural dependency has developed on getting the morning news from any different number of media outlets, commuter traffic in all urban areas has created an acceptable sound space and one which defines modern society. Video games, computer games, digitized music are all sounds created by the latest digital technologies. Cell phones ring constantly in crowded areas, and people talk out loud oblivious to what used to be the domain of a private social space. Personal ring tones add a further intrusion to the social environment. Jumbo jets scream across the sky smothering the earth with an eternal din of noise pollution. Any contemplation without the interruption from the mechanized world is slowly becoming extinct. The sanctity of experiencing one's own thoughts without a foreign intrusion may soon be lost forever. For the most part silence is becoming more difficult to find in the world and soon I fear the concept of silence will never be appreciated. But the one quality Vat Phu and the surrounding temples offer is an environment free from the intrusions of manufactured sounds. Considering it is now the early part of the 21st century its astonishing how still and peaceful Vat Phu is. If we were to go back in time some 1,500 years ago the Vat Phu area had to be enshrouded in only the natural inclusions of all the nature spirits. It was then that the wind moving in the trees, or the rain falling on the land, or the thunder in the heavens signified the arrival of the gods or spirits. With that in mind it becomes easier to understand the placement of these four temples around the main sanctuary at Lingaparvata. Those temples are, Vat Oubmong, Thao Tao, Nang Sida, and H. Tomo. Of the four H. Tomo and Vat Oubmong are the most difficult to reach. Thao Tao, and Nang Sida are on the royal road to Angkor Wat and just a short distance before you arrive at Vat Phu. Nang Sida is the most accessible of all four temples being only a short walk from Vat Phu's palaces, but Thao Tao has no access route from Vat Phu to visit it. All four of these temples have been carefully placed on the surrounding landscape as devotional monuments to Lord Shiva. With each temple there comes a story of a passage back in time to spaces devoted to the gods. What follows are the stories of those four passages. The first passage was to follow the river of stars to temple H. Tomo which is set in a deep jungle enclave on the eastern banks down the Mekong River. The mighty Mekong River that passes Vat Phu is none other than the river of stars forming the Milky Way galaxy. Vat Phu was the perfect mirror image of the universe. High atop Mt Kailasa lived Shiva with his bride and all around him were the sparkling stars of the heavenly apsaras. The great waters flowed from the Ganges out of Shiva's hair and filled the land with eternal life. Kuruksetra was as auspicious a site as any of the other locations for building temples devoted to Shiva. The Mekong River is compared to the great Ganges River of India. Once you began to travel on the river you knew that this same journey took place over 1000 years ago. The driver of our small boat, Xiang, balanced himself nimbly on the bow leading the way south on the Mekong to temple H. Tomo. Sitting quietly in the small boat I sensed nothing had changed for centuries. The Lingaparvata was still reaching to the heavens and the villagers were still fishing off their narrow long boats. Xiang set a course early that morning retracing an ancient route to one of the farthest temples aligned with the Lingaparvata. H. Tomo was devoted to Rudrani, consort to Rudra, a manifestation of Shiva known as The Howler and Rudrani was known as Kali the goddess of destruction. But now we know the symbolism embedded into Vat Phu where Rudra and Rudrani were cleansing the world in preparation for the return and new beginning of a New World Age. The white sandy banks were reflecting the morning sunlight with a parade of water buffalo going to the river to drink the cool water of the Mekong. Surrounded by the emerald green water of the Mekong the Lingaparvata receded in the distance as Xiang, Bountham and I headed south. I could only imagine what it must have been like to float the stones from the quarry behind Mt Phu Kao to this remote temple all the way down the Mekong. After successfully transporting the large stones they builders would then have to be carried them through the dense forest and finally set in them in place creating a temple surrounded by towering trees. Standing alone on the temple grounds was a single upright lotus column announcing the presence of a temple placed within the canopy of trees. The name for the temple comes from the name of a small tributary, the Huei Thamo, which empties into the Mekong. H. Tomo was a testimony to the dedication the Kings had for Vat Phu. 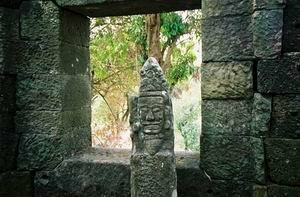 Over the centuries the temple has been totally abandon, but by walking very slowly and looking through the trees or on the ground there are carvings which bring to life the beauty of this secluded temple. Floral details on lintel stones, Shiva riding Nandin the bull, and a remarkable Mukhalinga (four faced linga) depicting the four directions which Shiva oversees. This is the only Mukhalinga still in situ in SE Asia. In a paper titled "The Khmer Contribution" by Troy Harris, a Buddhist Monk living in Singapore, there is included an analysis of the inscriptions from Temple Sdok Kak Thom showing that when King Jayavarman II initiated the Devaraja ,where kings become Cakravartins (God Kings), a brahman versed in the sacred Shaivite texts had revealed the hidden meaning within those texts to assure King Jayavaman's divine installation as the God King of the Khmer Empire. Harris brings to light the names of those texts which were four in number and named Vinashika, Sammoha, Nayottara and Shirascheda. Furthermore, they are also known as "The Four Faces of Tumburu". Harris shows in his research that Tumburu is an emanation of Shiva himself and depicted as Shivacaturmrti or "Shiva in four forms". What better tribute could then be made than to represent these four forms of Shiva with his four faces on the top of a linga. We will never know why this linga was carved the way it was but by looking at all the evidence surrounding the creation of the Devaraja in Kambuja we can infer with some degree of confidence that this was as close a reason as any for the creation of the Mukhalinga. Guarding the temple it's possible to find carved on the lower door frame of the western entrance of this small laterite temple a half horse half lion figure protecting the temple from intruders. Maybe this is Shiva manifested as The Howler. It is still possible to enter this small temple and get the impression of what this enclosure must have been like so long ago. Everywhere the forest surrounds the complex with wild birds chanting incessantly. Here is a temple surrounded only by nature dedicated to bringing to the world the grace for a new world. It's a perfect example of using the most secluded corners of nature to meditate on the future of the world. Temple H. Tomo is perfectly serene and an extraordinarily quiet space to visit. It wasn't until 1987 that the small temple Thao Tao was discovered lying on the distant plains south of the Lingaparvata. There are no roads leading to Thao Tao (Lord of the Tortoise) except for remnants of the ancient road that leads to Angkor Wat going south, and to Nandi Hall going north to Vat Phu. The temple sits in a field surrounded by trees, small shrubs and tall grass. Thao Tao is very small and in complete ruins with the exception of large sections of the wall that surrounds the two structures inside. In haste one of the small temples was reconstructed without much attention to the proper location of the stones. Inside in fact is a naga ante-fix lying horizontally under several rows of stones which is now used as a small alter. The shape and size of the temple is similar to the small hospital temples King Suyavarman VIII built along roads connecting the empire dating the temple after the 11th century. Nobody pays much attention to Thao Tao because for one thing it's totally inaccessible and not in very good condition. But what it does have, which is the reason I believe it was placed here in the first place, is a clear view of Lingaparvata. At this point in my story I have to say that the entire Vat Phu complex has to be understood as a truly holy land, a land touched by the gods, and a land that nurtured the growth and development of the Khmer empire. Through out the holy land there are many caves which acted as meditation cells for ascetics, and likewise small temples, such at Thao Tao, which also acted as meditation temples or small shrines to concentrate on the spirits that presided in the land as well as the gods in the heavens. The ancient Khmers and Chams both believed in land spirits so it was a natural fusion of beliefs when the Brahmins saw the natural outcropping of stones from the very top of the mountain to be a sign of Shiva's presence. A powerful union of beliefs from three separate cultures came together in a most unique way. While I was following my guide through the land to reach Thao Tao I had the odd feeling I was being watched. There was nothing I could see or hear that gave me any insight to my feelings. After visiting Beng Mealea I was convinced more than ever that the Neak Ta could be present and could take on any form. Maybe because I was familiar with how farmers would put an anthropomorphic image on their land (scarecrow) to frighten away the birds who would eat their crops was I prepared to witness what was about to greet me. Arms outstretched and looking directly at the mountain there stood what I knew to be a Neak Ta (land spirit). At first I thought it was just a coincidence of the way the dirt and grass were naturally put together. But when I went closer the arms were formed by a clump of grass, the leaves were used as eyes, and the body was a termite mound. Someone had tended to this outcropping and honored it as a Neak Ta. This time I was able to take a picture of the Neak Ta in broad daylight, unlike the one at Beng Mealea, which to my surprise appeared as an apparition at the end of a long gallery buried under the temple. Standing directly in front of the earthen image I knew that I was in the gaze of an ancient land spirit. To me it was a sign of being communicated to and I tried to understand what it was the Neak Ta was trying to say or what I should be trying to listen for. The field and everything surrounding me was extremely quiet and directly in the Neak Ta's line of sight was the Lingaparvata. Thao Tao was directly in the Neak Ta's line of sight as well as acting like a guardian protecting the sanctuary that lay unforgotten for centuries. It was not my imagination either. Having studied the work of Ang Choulean from Cambodia I could easily recognize how the people of the land could honor their spirits. So now I had two spirit signs before me. One was the top of Lingaparvata and the other the earthen mound of the Neak Ta. The day was extremely hot. Rain had not fallen for months and everything was scorched. The leaves crackled under your feet and the tall grass stalks snapped when you stepped on them. Once inside the temple grounds of Thao Tao the sky started to turn black and coming over the top of the Lingaparvata were large rolling black clouds. Surely, I thought, this was going to be one of the first great rainfalls of the season. Hurriedly we got inside the small temple enclosure with the small alter made from stones piled on one another. No sooner had we got inside the temple thunder began to rumble and create a great disturbance in the entire area that only a few minutes ago was perfectly quiet. I was ready for the sky to open up and drench everything. But the rain did not come as I expected. It was dark and quiet until a few small rain drops fell on the dry leaves making the sound of a very light tapping of a drum being hit with a small stick. Then hundreds of tapping and ticking sounds filled the air as the small rain drops hit the dry leaves and the thunder would interrupt like a big kettle drum of a symphony orchestra. I stood still and listened and at that moment I had the strangest feeling of a language being spoken by the nature spirits. I recognized that the entire land began to crackle and snap with a million different rain drops, but never a down pouring on the land. On one hand it could be said it was only a light shower with a little thunder. For those of us who wouldn't think otherwise that would be the best explanation for what was happening. But the clouds moved rapidly east and the sun was again pouring through the trees and it was hot again. For me it was an all encompassing experience to be with the nature spirits and their special symphony of leaves and rain drops with Airavata (Indra's mount) providing the thunder . The Neak Ta was looking at me and I could once again feel as if I was being talked to as I was in my dream by those visitors coming through the door in the cube. And here I was again, another cube, another door and another association of events not quite explainable, but feeling very much as if the land was still communicating it's message as it did so long ago for King Devanika and certainly for a long time before he arrived. Walking south on a small dirt road from Nandi Hall, parallel to the ancient road going south to Angkor Wat, you come upon Temple Nang Sida. Entering from the east there is a long wide approach to Nang Sida, which used to be lined with lotus columns but are now scattered all over the temple grounds. It is truly a grand entrance to the temple with the mountains in the back ground and groves of trees circling the temple grounds. Once you pass through these tree groves to stately entrance to the temple can be seen rising high above a wide stone platform made of enormous stones that are still perfectly placed forming a most impressive entrance and front porch to the temple. After walking over the stone platform you come upon the most impressive stone doorway with one large roof stone still in place connecting the two up right columns. Once inside the frontal area of the shrine a series of tall columns form an inner court yard with the uppermost parts of the columns (the capitals) completely decorated with beautiful floral motifs which appear on several levels or orders on the top of the columns with the roof stones still in place. It is an awe inspiring feeling to see such exquisite stone columns forming a quadrangle of regal proportions. By slowly walking around the central court yard and looking toward Lingaparvata with the majestic columns in the foreground the importance of Nang Sida becomes readily evident. There is also an north entrance to the temple with the door columns leaning precariously on the temple wall. The spire like effect achieved by these tall decorated columns indicates that this was more than just an entrance but a holy reception area before you entered the main sanctuary which unfortunately has completely collapsed forming the most impressive ruble of beautifully hewn massive stones. It is not possible to access any part of the central shrine. The only deity I could find was a portion of the top of a head showing the chignon hair style with an incense offering placed in front serving as a small altar. The only way to access any part of the central shrine is by carefully climbing up and over massive mounds of perfectly shaped stones which have apparently just collapsed on top of one another. On the northern side of the central shrine and buried behind the collapsed stones it is possible to see a false door with carefully carved lotus blossoms featured on the central vertical section of the door. However, of the west end of the central shrine there is another false door with the same identically carved lotus blossoms on the central section. On closer inspection of the lotus blossoms I was amazed to see them in near perfect condition after 1,200 years of weathering. It took considerable effort to get my tripod wedged on the stones to capture the details of this perfect example of Khmer craftsmanship. There is also a false door on the southern side but the collapsed stones have completely blocked its view. The lotus flower is a most significant symbol in the creation story of Vedic mythology as I have already mentioned with the Great Mother Goddess at the central shrine. The lotus flower is referred to as the cosmic lotus and is a major clue to the temples function. The decorative carvings and perfectly hewn stones indicate a very significant temple. The temple still holds many secrets which will be uncovered once the stones are moved and placed on the ground ready for cataloging and final restoration. But what remains for us to see today are several visible clues to the use of the temple. First and foremost is the temples location. It is only a short distance from Vat Phu and is the last temple on the ancient road before reaching Nandi Hall. Secondly, with the addition of a library and two other smaller structures on the temple grounds it could have easily served as the priests living quarters and school. Lastly, the decorative motifs and majestic columns, which form an impressive entrance to the central shrine, indicates a very high devotional tribute was made to either Shiva or Vishnu. My guess is it was a shrine to Vishnu and Lakshmi giving the high use of lotus blossoms on all the false doors. The lotus flower is also found on the false doors of the main palaces at Vat Phu. Not too long ago two farmers in Champassak had dug up a silver covered head of Vishnu on the Kuruksetra plains. At one time the royal family of Laos had acquired this badly damaged head of Vishnu but then it was lost and its whereabouts is unknown. The farmers tried to break the sculpture in half with a machete as is evident by the many knife marks on the front. It was found in a field close to Vat Phu and is dated between the 9th and 11th century. I can easily attribute this beautiful work of art with others surrounding Nang Sida and am certain more will be found near this temple when a serious excavation takes place. Emma C. Bunker and Douglas Latchford, two Cambodian researchers, included this photo of Vishnu in their monumental tribute to Khmer sculptures in a book titled, "Adoration and Glory: The Golden Age of Khmer Art". The next passage to a temple at the Vat Phu complex was going to be north to Vat Oubmong. Waking up on this particular morning I knew I was going to take a long walk some 2km to the temple called Vat Oubmong. I learned that in 1973 Pierre Lintengre found a Sanskrit inscription referring to King Jayavarman II at Vat Oubmong. This in itself was very important to me because in 802AD this very same King inaugurated the Khmer empire. Having an inscription about this King at Vat Phu was further confirmation on the influence the Lingaparvata had on the formative stages of fashioning the Khmer empire. It was a wonderland of multi-colored greens and I felt a part of each blade of grass as I followed behind my guides. Gentle Laotian music was drifting in the air serenading the villagers as they cut the rice in the cool of the morning and as we made our way along the base of the mountain. The walk was magical as millions of tiny white flowers were spread profusely in every direction forming a carpet leading to tunnels of under brush as we disappeared under trees only to find another path that would wind in every direction before reaching a mountain stream. The land gave an eerie sense of walking in a place occupied by beings who designed mystical spaces purposely to walk through. And after walking under the trees the path would open into a rice field and we would zigzag through the rice stalks and disappear again under the trees. We must have repeated this pattern for over 1km until the path, or what there was of it, stopped and we found ourselves climbing loose shale straight up the side of the mountain. Surely Vat Oubmong was not a temple that was frequently visited. Once we climbed a considerable distance up the rocky mountain side we entered a partially flat area on the side of the mountain and Canhsavang pointed with his machete and said, "Vat Oubmong is straight ahead". I couldn't see anything that looked like a temple. But what I did see, straight through the tree tops, was the most perfect view of the very top of Lingaparvata. Even though I couldn't see Vat Oubmong I knew exactly why it was placed here. No matter how hard I looked into the trees I could not see Vat Oubmong. The forest had completely swallowed the temple. The trees had grown all around the temple concealing it from view. There were no access points either that could be found to even approach the temple. The small machete Canhsavang brought with him was pulled out from his waist sash. The bright morning sun hit the metal blade of his machete and reflected it in every direction as he miraculously began to clear the trees around the temple. After several hours of cutting small trees the brick enclosure to Vat Oubmong with its sand stone door columns and truss stone could be seen towering into the sky. From the girth of the trees at least 6 years of growth had taken root around the temple. Here then stood Vat Oubmong 2km north of Vat Phu high on the side of Lingaparvata. Here was placed the sacred linga to Shiva and directly behind the temple above the trees way in the distance was the top of Lingaparvata. Vat Oubmong and Lingaparvata were aligned perfectly with one another creating a union of the natural rock out cropping of the mountain with the top of the linga inside the temple. If ever there was a shrine perfectly fused with the spirits of the land Vat Oubmong was a perfect example of the marriage. The linga which would have stood inside the brick enclosure would itself have to have been a massive carved stone judging by the size of the pedestal it sat on. Two such pedestals exist at the temple one directly inside the temple with a large gapping hole directly underneath it where surely holy objects have long since been removed. The second is about 10 yards in front of the temple. This pedestal has also sunk and also has a large opening directly underneath it. Imagining how the sandstone columns were carried up the mountain side as well as the linga pedestals and Shiva's lingams conjures up feats of super human strength and devotion to Lord Shiva. is Willard Van De Bogart. He lives in Nakhon Sawan, Thailand.